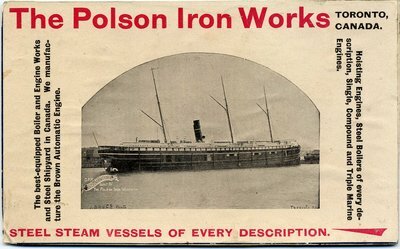 Advertising card for the Polson Iron Works in Toronto, Canada featuring a photograph of the Canadian Pacific Railway steamboat MANITOBA. The picture is probably from Owen Sound where the Polson's built the MANITOBA. "The Polson Iron Works Toronto, Canada." "Steel Steam Vessels of Every Description"
"The best-equipped Boiler and Engine Works and Steel Shipyard in Canada. We manufacture the Brown Automatic Engine." "Hoisting Engines, Steel Boilers of every description, Single, Compound and Triple Marine Engines."